Own your dreamscape backyard with a fantasy pool and lavish appointments like waterfalls, fountains, firepits, outdoor kitchens, and cabanas. Our experienced in-house designers utilize state-of-the-art 3-D software to create a design that you can virtually walk through before the project begins. We specialize in inspirational outdoor spaces that are perfect for living and entertaining. Our luxurious and exciting designs will make your home ideal for staycations, neighborhood parties, and family get togethers. Ocean Blue Pools & Landscaping can complete any outdoor project. Our professional team has experience with pools, spas, “spools” and water features. 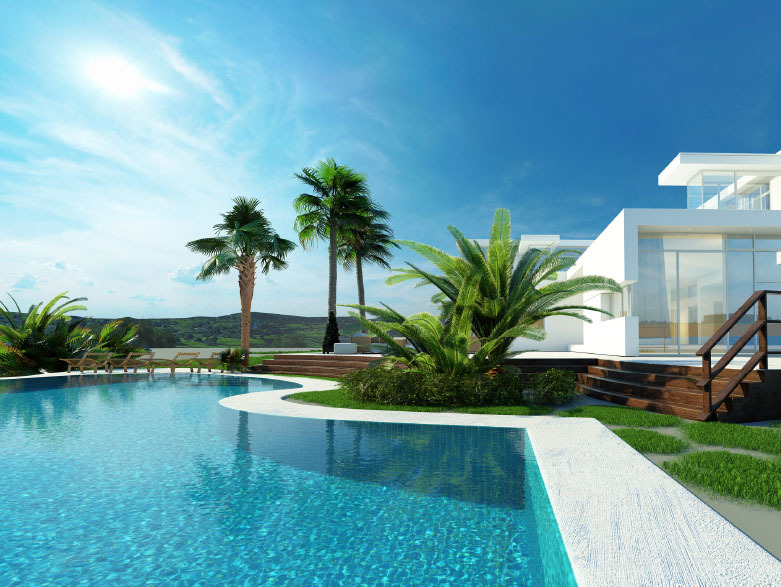 Whether you have a design and planning firmly in place, or are looking to our state-of-the art 3D Studio to help fully realize your vision, Ocean Blue Pools and Landscape can step in at any point in the process to create the quality outdoor space you’re searching for. You can rest assured when you hire Ocean Blue Pools and Landscaping that your project is in good hands. With many residential and commercial projects completed, there’s very little that we haven’t seen before. As Ben is fond of saying, “there is always a solution”, so whether you’re thinking of building your vanishing edge pool on the side of a cliff to take advantage of an amazing view, or dealing with city permits, your HOA, or any other unforeseen problem, “can’t” is not in our vocabulary, “there is a solution”. Ocean Blue Pools and Landscaping takes pride in the quality of our work and guarantees that you will receive the most competitive bid. We are proud to have an A+ rating from the Better Business Bureau. Contact us today for your free consultation and take the next step towards thoroughly enjoying your outdoor space. Owner Ben Tabrizi has been a general contractor since 1997, and building pools and installing landscaping since 2009. Ben brings a wealth of experience to any project, with over 20 years in the industry.